The non-debate over the placement of ‘To be or not to be’ is illustrative. As others have noted, it is not really that radical, and I recall four years ago I was sitting in almost exactly the same seat watching Thomas Ostermeier begin Hamlet by repeating the line continually for two minutes before preceding to rip the classic text to shreds, yet this didn’t lead to several thousand words of journalistic clamour. Yet placing the speech at the front of the play would thrust Cumberbatch even further into the spotlight. It is the most famous soliloquy in drama, and a huge decision to lead with it. A more traditional placing takes away the pressure and helps to reduce the centrality on Hamlet. It is a wise choice and one that suggests Turner is a director sensitive to audience reactions and capable of responding to them. There are many interpretations of Hamlet but productions can be broadly can be separated into two camps. The first is to follow Hamlet and believe ‘the play’s the thing’. Stick to Shakespeare’s text and the wider themes of the play emerge. It is a reading that places primacy of Hamlet the play over Hamlet as a character study; it becomes more of an ensemble production, and the wider political dimension is often given greater centrality. The marvellous version at the National with Rory Kinnear’s Hamlet living under a surveillance state governed by Patrick Malahide’s Claudius showed the strength of this approach. Equally the remarkable Hamlet de Los Andes demonstrated the malleability of the play’s political dimension by applying it to the politico-military instability that ripped apart Bolivian society in the 20th century. The second reading is to make the play about Hamlet the man. Here the nature of the performance and the decisions the actor playing Hamlet takes become critical. 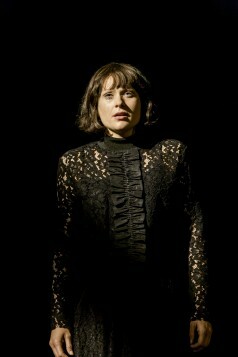 The play itself increasingly focuses on Hamlet’s internal state, whether it is through Hamlet the student whose philosophising renders him too indecisive to strike, or in Hamlet as a psychological study of a man who finds himself paralysed when he tries to act (Michael Sheen’s performance in a RD Laing-inspired production is the most recent to have take this path). Under Lyndsey Turner’s strong direction, the play displays an admirable clarity of vision and sense of purpose. This is Hamlet that exists in the world of European geo-politics. We are in a Denmark that must constantly look beyond its borders. References to Norway, England and Poland are not just throwaway remarks but the heart of the play; Elsinore is not a stable place, and Claudius is a man more concerned with the survival of his country than the madness of Hamlet. This is rammed up home with the return of Laertes. Often staging makes this curiously muted but here Kobna Holdbrook-Smith’s Laertes literally storms the palace with armed guards. 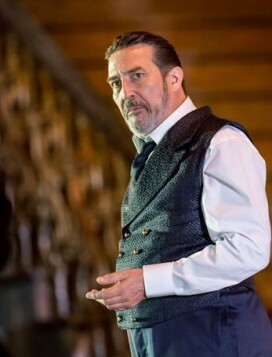 For once Claudius’ question “What is the cause, Laertes, / That thy rebellion looks so giant-like?” makes sense to the audience, and it is because we see that the state is on a knife-edge and Claudius a man bargaining for his survival. Within this production, Hamlet must also change. A key line, which seems to echo through the text, is “The time is out of joint: O cursed spite, / That ever I was born to set it right!” It is an interesting marker because it has the traditional reading of recognising the Ghost’s call for revenge on his murderer. However it also hints towards the divine right to rule. 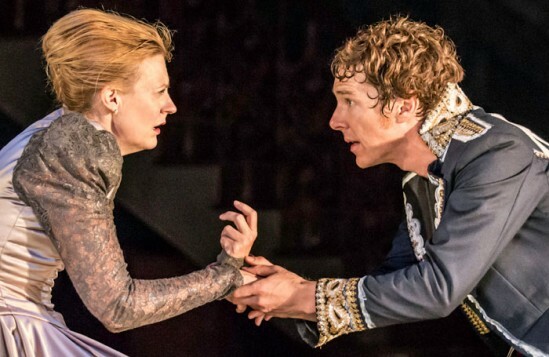 Hamlet would have followed his father to the throne but for Claudius’ intervention. Time is out of joint because the natural order of things has been disturbed. In this version Hamlet is a man much capable of political intrigue. There is more method in his madness than in many productions. It is clear he is acting the part of madness, but doing so with the license that his status gives him. When he responds to Laertes at Ophelia’s funeral with “This is I, / Hamlet the Dane”, it more than hints at a man who assumes his noble birthright. Furthermore he is able to do this because his privileged position is reinforced by his popularity with the people in a country on the brink. Hamlet fully understands the game, and it is one that at times he plays with chilling precision. There is a casualness that describes the fate of his childhood friends, Rosencrantz and Guildenstern, that tell of the machinations of a man used to playing with high stakes. Equally the death of Polonius is undertaken with more intent than is often seen. It is curious that the death is usually referred to as accidental. He may not have intended to kill Polonius but stabbing at a form behind a veiled curtain is a very loose interpretation of what ‘accidental’ is. Most tellingly, his treatment of Ophelia throughout the play is brutal and there can be no doubt that her descent into madness lies with Hamlet. The strength of this production, and its ability to convey a clear sense of a place and time that supports Turner’s vision, lies in Es Devlin’s breath-taking set design. This should not be a surprise as Devlin may well be the most highly-regarded set designer working today, and boasts a C.V. that includes the London 2012 Olympic Closing Ceremony, concert tours for U2, Miley Cyrus and Kanye West, alongside wide-ranging work for theatre and opera. Recently she produced incredible visuals for The Nether and teamed up with Lyndsey Turner on Chimerica and American Psycho. Devlin has proved herself to be a very special talent, and a fine exponent of VFX. Yet what is impressive about the spectacular set is that, for the most part, it strips away the technological gadgetry. The Barbican is a huge space, but Devlin finds a way to make it appear even larger. As the curtain rises the audience find themselves transplanted into the middle of something akin to a Nordic Versailles. The clarity and detail is such that the set resembles a glossy oil-painting; a fact acknowledged in the scene welcoming Hamlet’s return to Elsinore. which is deliberately set up to resemble a modern take on Da Vinci’s The Last Supper. Hamlet sits centre of the table, both a part of, and apart from, his fellow diners. Symbolically he is dressed all in black, and everyone else in white. It is a sign that he stands apart, but also reflects the reality of a time when he mourns for the death of his father, whilst the others celebrate the marriage of his mother. There is a moment (which I will not spoil here) when Devlin’s set doesn’t just exist as a work of theatrical design, but suddenly becomes intricately and inseparably linked with the themes of the play. It is the tipping point when functional excellence becomes artistic brilliance. It is a bravura moment of stage craft, of director and designer working harmoniously in one. Whilst it is easy to be wowed by special effects, it is far more impressive to be blown away by something built out of wood, nails and paint. Yet when the moment comes, it is hard to believe that anyone watching won’t draw breath. I make no apologies for this review failing to mention the performances. There will be many blogs who focus on Cumberbatch and very little else. It felt right that when the direction and design are this strong that they are afforded the same opportunity to be centre stage. Also I’ll be going back to watch it in early September and once recovered from the visual impact, it will be possible to give far more attention to the performances. 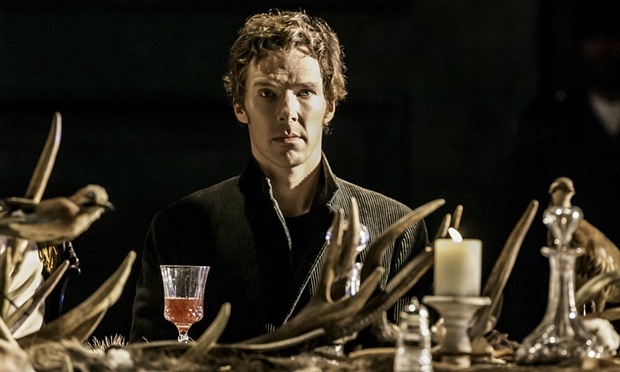 So readers can expect Hamlet Round II when you can have your fill of Cumbernalysis.